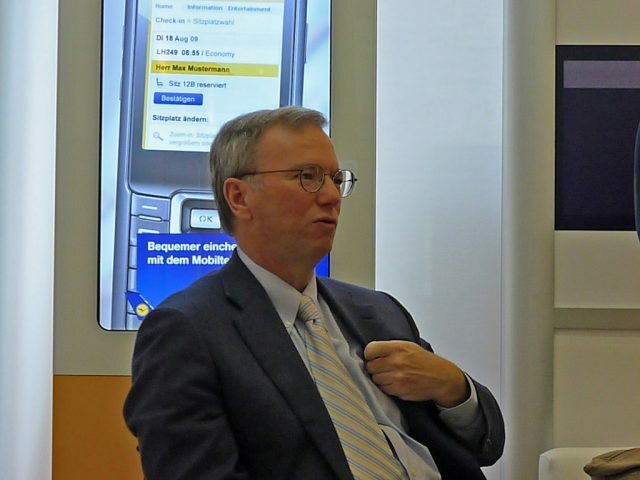 Heu­te Mit­tag hat­te ich die Ehre und das Ver­gnü­gen, zusam­men mit eini­gen Kol­le­gin­nen und Kol­le­gen von der Pres­se Eric Schmidt nach des­sen Abschluss­vor­trag bei der Bur­da-Inno­va­ti­ons­kon­fe­renz DLD noch eine gute hal­be Stun­de lang zu lau­schen und Fra­gen zu stel­len. Ich habe bis eben gut die Hälf­te der Auf­nah­me von mei­nem Live­scri­be-Smart­pen abge­hört und ein paar Zita­te her­aus­ge­schrie­ben, die ich inter­es­sant fin­de. Watching the press, no one seems to under­stand that we’ve always run [Goog­le] in an uncon­ven­tio­nal way–which has I think been our strength–and none of that’s gon­na chan­ge. The other thing to say is: We’re best fri­ends, we’re com­pu­ter sci­en­tists and we agree on liter­al­ly ever­ything. So I dont’t think there’ll be much chan­ge. I’m actual­ly com­mi­ted to Goog­le. A deca­de? Lar­ry said such pre­dic­tions are too short. And he’s youn­ger than me. At Goog­le I would want to be a pro­grammer. […] We have the best com­pu­ting infra­st­ruc­tu­re to sol­ve the hard com­pu­ter sci­ence pro­blems at sca­le. Brain drain at Goog­le? Ano­t­her fic­tion of the media. We’ve actual­ly stu­di­ed this qui­te care­ful­ly and our reten­ti­on, our tur­no­ver has been exac­t­ly the same for several years. Peop­le who are lea­ving get publi­ci­zed. But all the incredi­ble talent that comes to the com­pa­ny we choo­se not to publi­ci­ze. He [Lar­ry Page] is fun­da­ment­al­ly a deeper thin­ker than any­bo­dy else. So the things he does are so much more tho­rough­ly thought out–you know, he’s a geni­us. When you talk to him, it’s a bril­li­ant mind and his gift is that he just sees it, like in Chess–he sees that few moves deeper than I do. What are the pro­blems Goog­le has? Usual­ly the press are asking about our pro­blems becau­se they don’t wan­na talk about all the good stuff. We’ve got very com­pli­ca­ted government issu­es. [… ] Becau­se we move quick­ly, we tend to be dis­rup­ti­ve at scale–and becau­se it’s about infor­ma­ti­on. And ever­y­bo­dy cares about infor­ma­ti­on. Our soci­al view is qui­te dif­fe­rent from what peop­le are say­ing. The easiest way to under­stand this is: If you gave me your list of friends–with your permission–we could make that one of the signals to make your search qua­li­ty bet­ter. We could give you bet­ter You­Tube vide­os to sug­gest for you. If we can make Goog­le more personal–in the same way that Face­book is very personal–then it makes all of Goog­le bet­ter. It’s not a Face­book com­pe­ti­tor. 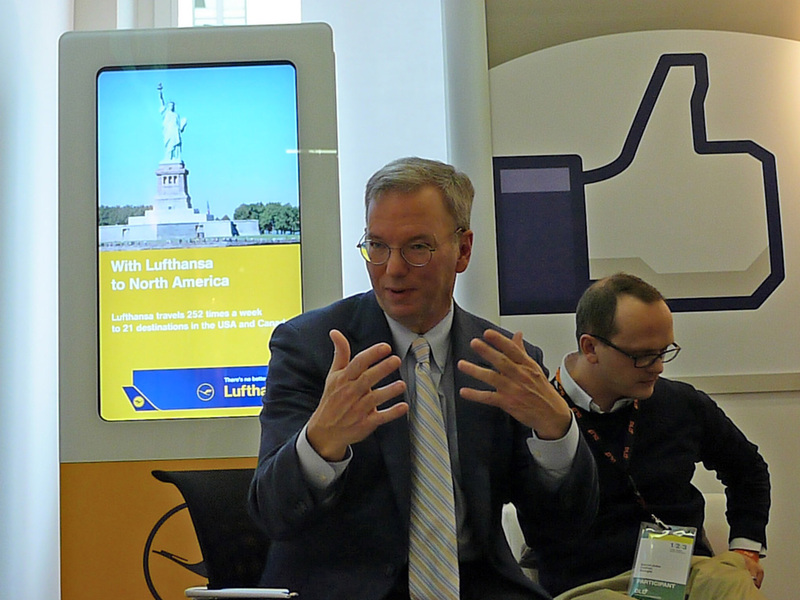 If you read the sto­ries, the press wants to wri­te „Goog­le laun­ches Face­book kil­ler“. Which is pre­cise­ly what we’re not doing. Goog­le uses signals to do ran­king. Hund­reds of signals. If you give us–with you permission–a litt­le bit more about who your fri­ends are, we can make the results a litt­le bit bet­ter. Becau­se it beco­mes ano­t­her set of signals. It doesn’t replace the exis­ting signals. The­re are many, many other signals. And the list of signals is pro­prie­ta­ry, it’s a Goog­le secret. The Ora­cle lawsu­it against Andro­id is wit­hout merit. Remem­ber, I was at Sun and did the Java stuff. So we at Goog­le are being sued about things that the team I mana­ged did at Sun. I have a lot of infor­ma­ti­on about this–it’s wit­hout merit. Why are we giving this [Andro­id] away? It’s simp­le: Peop­le who use Andro­id search more than peop­le who don’t. And we make money from sear­ches. Andro­id has paid for many, many times alrea­dy. We love Andro­id, it’s a huge reve­nue source for a free pro­duct.